Zebra ZT420 replacement printheads - our genuine Zebra ZT420 replacement printheads deliver quality, reliability and performance. The Zebra ZT420 printhead is easy to install and made to exacting engineering standards for continued reliability and performance from your printer. Genuine Zebra replacement printheads for Zebra ZT420 203dpi and 300dpi industrial printers. 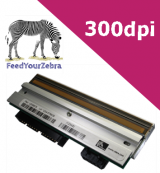 This genuine Zebra ZT420 replacement printhead from FeedYourZebra delivers quality, reliability and performance. The printhead is a vital component of your ZT420 printer that creates the image on the face of the media. Worn or damaged printheads should be replaced immediately. The Zebra ZT420 printhead is easy to install, and made to exacting engineering standards for continued reliability and performance from your printer. The printhead is the most critical component of you printer and one of the most delicate. Most print problems are a direct result of impoper care of the printhead. A consumable that wears over time, much like the brakes on your car, it requires proper installation and ongoing maintenance to ensure a long life of service for your printer. Maximising printhead life is important to users of thermal printing technology because it reduces printhead replacement costs and increases productivity. However, with proper installation, ongoing careful attention and maintenance, you can maximise the life of a printhead. FeedYourZebra can help maximise the life of your Zebra printhead and ensure the highest possible print quality with this Zebra printhead cleaning kit available here. When replacing your printhead, be sure to follow the directions supplied with the printhead. Only use a genuine Zebra printhead available from FeedYourZebra to ensure that your printer and part warranties remain intact and that the product performs optimally. Zebra recommends the cleaning of the printhead regularly, either after roll of thermal transfer ribbon or after every roll of direct thermal labels. For 600dpi printers, clean after each roll of labels or when a "CLEAN HEAD NOW" warning appears on the LCD. If you are looking for genuine Zebra direct thermal labels, Zebra thermal transfer labels, Zebra thermal transfer ribbons or Zebra replacement thermal printheads, then you'e found the right place and FeedYourZebra can help. With over 10 years experience, we are a leading Zebra authorised reseller, supplying genuine Zebra products throughout the UK and EU. We have the widest stock of Zebra labels, ribbons and printheads available for next day delivery. All items are shipped free of charge - even to the EU (for a list of the countries we supply see here). We supply direct thermal and thermal transfer labels for Zebra desktop printers. Zebra desktop range consists of LP2824, TLP2824, LP2844, TLP2844, GC420d, GC420t, GK420d, GK420t, GX420d, GX420t, GK430t, GC420d, GC420t and GT800 printers. Labels for the Zebra desktop printers are supplied on 25mm cores and have a maximum outside diameter of 5" (or 125mm). They are not interchangeable with labels for Zebra industrial printers due to the different size core and small maximum capacity. With the exception of the Zebra LP2824 and TLP2824, the maximum label width available is 102mm. The LP2824 and TLP2824 has a maximum label width of 57mm. Zebra thermal transfer ribbons are available for the Zebra desktop range, however, you should note that certain models are direct thermal only printers - so don't have the capability for using thermal transfer ribbons - these are LP2824, LP2844, GK420d, GX420d, GC420d printers. FeedYourZebra supplies labels for Zebra mid-range, industrial and high performance printers. Labels for these printers are supplied on 76mm cores and have a maximum outside diameter (roll size) of 8" (or 203mm). Different models in the industrial and high performance range are available - some of these models have differing maximum print widths - and so the maximum width of label that can be used varies across the ranges.